Detroit fans, hang on just a bit longer. There’s still some work to do over here. Once again, this series continues to defy matchup expectations. It is simply a great League Championship Series, and it is destined to be remembered that way. There is a Game 7 Thursday night at Shea Stadium, and the winner goes to Comerica Park two nights later. The Mets have named Oliver Perez — who was so-so in his previous NLCS start in St. Louis — to start the finale against Jeff Suppan, who mastered the Mets’ lineup and even homered in his outing. "If you’d have told me that when the day started that they’d have four on the board…" That’s how Cardinals manager Tony La Russa started his postgame interview session, referring to his expectation that St. Louis might have "marked" at least four times. He had possible repeat Cy Young winner Chris Carpenter up against rookie John Maine, but once Jose Reyes led off with a homer, all expectations faded to reality of a great series. "I’m sure they’re very happy with him," La Russa said of Maine. "That first inning, he faced a big problem and he got out of it. It seemed like he got more and more confident, and got them into the sixth inning. That’s to his credit. … Yesterday, they had a guy going to the Hall of Fame, today we had a Cy Young winner — that’s what matchups do for you." La Russa also said people would have seen "a different Billy Wagner" had the Mets been ahead by two runs instead of four. Mets manager Willie Randolph, who has given his players a Detroit itinerary as a show of confidence, was beaming about Maine’s outing. "I just tell him all the time, ‘Just go out and have fun,’" said Randolph. "I’ve challenged him many times. … He’s been golden for us." Maine said that he had "jitters" at the start, but wasn’t overthrowing. How clutch is So Taguchi? He is 4-for-4 this postseason with two homers. I’m sure a lot of people back in Japan would like to see him play more, but that’s one jam-packed Cardinals outfield. Paul Lo Duca: "I can’t even imagine what tomorrow is gonna be like." Anything can happen, as this series has proven. It will be a wild scene at Shea for the last one. So, who do you like in Game 7 of the 2006 NLCS? Cardinals manager Tony La Russa is in the interview room right now (5:29 p.m. ET), and said David Eckstein, who is battling shoulder and finger injuries from Game 5, told La Russa to write him into the lineup. "My guess is he’ll play," said La Russa, adding the shortstop is the "toughest guy I’ve ever been around." Willie Randolph preceded La Russa in the room and was asked if he has definitively settled on a potential Game 7 starting pitcher. "Not definitively, no," he said. "We’re going to see how things play out today. Everyone is just about available, except maybe Tom Glavine. We’ll see what happens at the end of the game here and we’ll make a choice tonight or tomorrow. Tonight probably." Randolph said he probably would go with Darren Oliver tonight if he needs a long man. "If it’s early, I won’t hold anybody back." The manager also got a bit irked when the final line of questioning focused on whether he is "disappointed" about where things stand. "You’re not giving in, you’re not giving up, are you?" We’re back. My flight from St. Louis on Wednesday connected through Cleveland and I went straight from the airport to Shea Stadium. I just shot these pictures at 3:30 p.m. ET from the press box level. It is magnificently sunny and was 70 degrees when I landed, lugging a heavy down coat that was a real space-waster on this travel day. It will work in Detroit, though. For now, there is the small matter of deciding who the Tigers finally will get to play. Quickie NLCS blog question: Would you rather be the Tigers with a full week of rest and preparation, or would you rather be the Cardinals or Mets, going right into the Fall Classic as if it were regular-season mode and the killer instinct in tow? Here is another lasting image from St. Louis, taken during that transition time between Mets and Cardinals BP before Game 5. This kind of stuff never would have been allowed in the old days of baseball, but players hang together and then are enemies for a while and then hang again. First pitch for Game 6 is at 8:19 p.m. ET. The Cards lead the series 3-2. Will it be a rematch of the 1968 World Series? Will the Mets make this one go seven and make Detroit wait as long as possible before knowing what visitors will arrive at Comerica? Like Tommy Lasorda says, watching this one is your duty, Judy. By the way, make sure you’re also blogging about all of this, not just commenting. Others in the MLBlogs community include Brooks Robinson, David Wright, Cliff Floyd, John Rodriguez, club broadcasters like Daron Sutton, mascots like Wally the Green Monster and Raymond, authors like Curt Smith and Zoe Rice, and more. Browse MLBlogs by club and join them. 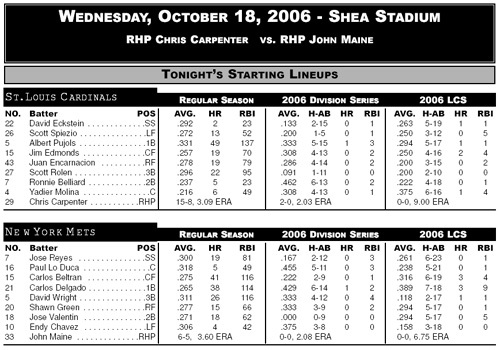 Chris Carpenter, reigning NL Cy Young Award winner and possible 2006 Cy Young winner, vs. rookie John Maine. But for all of us who have been following this series closely, this much is certain: It’s a battle royale. The Mets are going to be back in front of their home crowd. Carlos Beltran will be playing again. Nothing is a foregone conclusion by any means. – The last time there was a sweep in one LCS and a 4-2 outcome in the other, it was 1995 when Cleveland beat Seattle in six and Atlanta beat Cincinnati in four. – The last time there was a sweep in one LCS and a seven-game series in the other, it was 1988 when Oakland swept the Red Sox and Los Angeles finally eliminated this same Mets franchise. That is what I keep thinking about: What a contrast between what the Tigers did to Oakland in an ALCS that seems like it was a month ago, and in this series that is like a heavyweight fight with each round being given to the boxer in the other corner. It’s not outlandish to expect Maine to come up with a huge performance. You think of what someone like Brandon Backe did to the Cardinals for Houston in a past NLCS. But it is really hard to imagine Carpenter going through another hammering like the one he took in Game 2. I would say definitely advantage, Cardinals. With the proviso that the other fighter has always come right back with an answer so far in what has been a fantastic, if rain-infested, NLCS. This was my first visit to new Busch and it was positively stunning. There was some murmuring on local sports talk radio about whether the crowd in the lower bowl here has become too conservative and even controlled. Hogwash. Anyone at Busch for Game 5 will be hard-pressed to remember a more thunderous/constant crowd display than what just happened. After Preston Wilson came through with the bat, my seat was literally swaying like a tremor. Re Pujols vs. Glavine and their little soap opera: Sir Albert walks the walk. Not that there was ever much doubt. Two great warriors, just trading punches, like the series in general. See you from New York, and will get back to the Powerblogging once I’m at Shea. Have to sleep for an hour and a half, and you never, ever complain when you’re watching postseason baseball! If you want to know why Game 5 of the National League Championship Series was rained out Monday, then there is a Canon Powershot video I took while driving to the ballpark. The announcement of the second rainout (are you kidding?) in this series was made within the hour once I arrived. Also in this video, you can hear the local St. Louis all-sports talk radio station dealing with the other hot topic in sports: That Miami-Florida International football brawl and the unbelievable radio call by a former Hurricane player who wanted to jump on the elevator and go join the fight on the field. (He was subsequently released from duty, thankfully.) At least we have a peaceful NLCS. Stan the Man was dripping wet all day here beside umbrellas in St. Louis, so we’re just talking some baseball here. The second-best news was that the rainout decision was made in the afternoon instead of waiting until gametime. Why second-best? Because the best news is that two starting pitchers will be operating on their normal rest, so Tom Glavine of the Mets and Jeff Weaver of the Cards should be at full strength — which is what you want to see in a game that is being described in clubhouses as "pivotal." "Both guys can work on full rest," Scott Rolen said, "and that’s the way it was supposed to be if not for the first rainout in New York." As for the rest of the players, Rolen said, "We play 20 or 21 straight during the season — it doesn’t make a difference to the rest of us." Cards manager Tony La Russa was asked in his office after the game was called: "What type of pitcher is most affected by throwing with [three days’] rest?" "It depends on a guy’s arm," La Russa said. "If he relies on extra life, the life is not there. He has to compensate by changing speeds. If he’s got good movement, sometimes he has more movement. It comes down to the type of pitcher you have." (a) He is talking to his friend Jim Leyland twice a day while the Tigers are waiting. La Russa said his experience with Oakland during its World Series appearances showed him that the NL champ will be at a disadvantage if the NLCS goes seven games, because after celebrating, there’s a quick turnaround to Game 1 of the Fall Classic. "The preparation is a significant advantage for the team that gets in early." (b) He was visibly shocked by the news that Ken Macha is out as Oakland’s manager. "They had a [heck of a] year. The second baseman and shortstop didn’t play in the last series, and they were missing [Rich] Harden much of the year. I’ll be interested to see what [A’s GM] Billy [Beane] says." Noting the fact that San Diego skipper Bruce Bochy reportedly has been allowed to look at other openings, as well as the firing of Florida’s Joe Girardi after a possible NL Manager of the Year season, La Russa quipped to a laughing audience: "I don’t know whether I should try to win or lose here." La Russa also said only marginally tongue-in-cheek that "evidently the standard has been set, and Jim [Leyland] is screwing everybody up." And as for Lou Piniella taking over the Cubs, La Russa said, "The Cubs are replacing a great manager with a great manager." La Russa said he voted for Girardi with his ballot by Sporting News for Manager of the Year, "but I think Lou is a great manager." (c) He is definitely worried about Albert Pujols’ right hamstring. During the mass-interview session, La Russa said: "You probably noticed, he’s laboring when he runs. His right hamstring is a real problem. … He can hit some home runs and catches it right, but he’s not going to be generating as much power, but he can still generate base hits. [He] just [has] to be careful running." Pujols comes into the clubhouse after each game with a monster-sized icepack bandaged to the hammy. In his office, La Russa elaborated: "You worry about the ninth inning, a ball hit into the hole — what’s he going to do, check up? He’s going to run. He’s got a problem there that’s significant enough for me to mention. … Those things improve by resting." That is video I took of the Cardinals’ biggest thorn in their recent postseason history. Carlos Beltran was leaving BP before Game 4 to head for the clubhouse, and he proceeded that night to scorch the Redbirds again. The Mets now have home-field advantage again in what has become a best-of-three, and I don’t think St. Louis can survive a constant assault by him the way they did when he was with Houston in the 2004 NLCS. There is too much ammo all around him. People in St. Louis are counting on Chris Carpenter and Jeff Suppan somehow shutting him down in those last two games — assuming there’s a Game 7. Mets manager Willie Randolph talked about how Pujols has not been allowed to erupt the way fellow stars Beltran and Carlos Delgado have: "He’s gotten a few hits but he’s hit some balls hard at some people, too. So I’m not going to talk about how we’re going to go after him. Just hope that you keep the ball in the ballpark against him and we’ve done that so far." OK, we’ll try to do it all again here Tuesday. One thing that wasn’t rained out here was a chance this morning to carve a couple of pumpkins with my dudes. Here’s Ben’s pumpkin, with Yadier Molina-like eyebrows. And here’s Josh’s — note the "L" on the forehead — so apparently this one is for whichever team does not advance. It’s been entertaining. You never know what’s going to happen next. It’s the only series played so far in this postseason in which the losing team will have won at least twice. The pattern has been shutout, losing team has lots of homers, shutout, losing team has lots of homers. The lack of pitching by the Mets’ starters has gone exactly as many people predicted, after all of their personnel losses. Yet, they have regained the home-field advantage. And as one of my colleagues just noted, after watching Anthony Reyes’ outing in Game 4, how bad could Jason Marquis have been not to be here in that role? I am tired of weather forecasts. After waiting through a rainout during the American League Division Series between the Tigers and Yankees, after waiting through a rainout at the start of this series, now we’re told that there is an 80 percent chance of rain Monday night. Please, not another lost travel day and more flight/hotel changing. Stay tuned, and meteorologists, speak up here. It was a really tough Sunday in St. Louis. Rams fans suffered a heartbreaking loss when the Seahawks kicked a game-winning field goal as time expired several blocks away. A few hours later, the Cardinals suffered what could become a backbreaking loss to the Mets. It’s amazing what you can do with a Canon Powershot A540. The videos I have uploaded and posted on this and my previous ALDS blog have been viewed more than 7,000 times. Someone just asked if I shot video of Constantine Maroulis’ "God Bless America" performance at Shea. Unfortunately, no — just trying to sprinkle vids in where possible to help capture the on-the-scene ambience and experience blogging the way so many other people are these days, with text just part of the whole blogging picture. But that’s a pretty cool thought, trying to upload vids of every National Anthem and "God Bless America" rendition. Oliver Perez vs. Anthony Reyes. Definitely a huge matchup back in Mexico, where people surely are following a matchup between two of their countrymen. As for the game: Maybe not a must-win for the Mets, but they can ensure that the National League Championship Series returns to Shea. Lou Brock was just introduced to throw out the ceremonial first pitch tonight. Yesterday he was over in Kansas City at Buck O’Neil’s funeral. It turns out that Buck had been the scout who signed him. This was kind of interesting — I ran into Lou near the elevator as he entered the lobby at Busch with his wife. I asked if I could take his picture with the Canon PowerShot, and he grabbed the camera out of my hand and took mine. You don’t argue with Hall of Famers. Then I said, "I am not kidding, I really want to take your picture." He gave it back. St. Louisans will be interested in this new trend during the NLCS. They built this ballpark right up against the edge of I-40 ("Farty" as it is commonly pronounced here by the natives), and if you go out to the edge of the concourse between innings, you will notice that cars honk as they drive past. There is a mighty doubleheader in St. Louis on Sunday, with many fans here at Busch Stadium coming over from the Edward Jones Dome, where the Rams took the lead in the final two minutes on Torry Holt’s incredible TD catch — only to lose by two on a Seahawks 54-yard field goal as time expired. Legions of fans wore red under their Rams regalia during that game and then uncovered it on their way here, or else put red over their NFL attire on the way. Continuing our regular NLCS blog feature, here is a Q&A with one of those people: Scott Meyers, 16, of Chesterfield, Mo. MLB.com: Tell us about the little football game here in town today. Cards/Rams Guy: It was pretty exciting, but we couldn’t stop them at the end like we should have. I was hoping we would have blitzed on the last drive. I thought the TD was great for Torry, but we got on the board with too much time left. MLB.com: What do you think of the NLCS so far? Cards/Rams Guy: I’m thinking definitely a Cards win tonight, and maybe Albert Pujols goes deep. Actually, I’m a little surprised. I thought we’d be down 2-0 coming back from Shea. Once we got that split, things definitely have turned in our favor. MLB.com: Can you describe the scene of so many Cardinals fans doing the NFL/MLB thing today, and what kind of day this is in St. Louis sports? Cards/Rams Guy: Immediately after the game, in my section (149), a lot of fans started chanting, "Let’s Go Cardinals!" That was awesome. It’s amazing how much things have changed since late in Game 2 and that 11-pitch at-bat by Albert Pujols to now. Suddenly, the Cardinals look very strong and in control with a 2-1 lead. Some notable discussion points for commenters: (1) David Wright has to start hitting; (2) Scott Spiezio’s red soul patch is becoming a major retail feature in the Midwest; (3) Darren Oliver looks like a nice No. 2 starter on this team and actually just threw one of the best outings of the entire postseason; and (4) it’s anyone’s guess what will happen with a matchup of rookie Anthony Reyes and Mets starter Oliver Perez. I also wonder what a full week-long wait over in the American League might do to the red-hot Tigers, who are awaiting the winner of a series that is just getting going. It is the largest crowd ever to see a National League Championship Series game at new Busch Stadium. OK, it is the first NLCS game here. But what a scene. It is such a dramatic difference here from what it was like at old Busch in that it is so much more intimate, with incredible views. We just heard Steven Tyler of Aerosmith singing "God Bless America," and let’s just say he sounds great singing "Walk This Way." At least the Cardinals are hitting the high notes for their fans in this one. Most popular chant of the night: "Sooooooup!" The 300-level Redbird Club suite area is just remarkable, and these wall-hangings help capture so much of the baseball tradition here.